Add a touch of Christmas magic to your home with this lovely DIY Build a Scene embroidery hoop decoration! This festive project looks great and it’s super easy to make. We chose this adorable log cabin scene taken from a 6” x 6” Craft a Card die to create our hoop, but you can customise it with your choice of Build a Scene die and a range of coloured card to really make it your own. 1. Die cut the Build a Scene die from 2 x black card, 1 white card, 2 x brown card, 3 x red card and 2 x green. 2. Cut the cloud and the snowy ground out of the white die cut sheet and adhere them on top of one of the black die cut sheets with glue. 3. Cut the circle from one of the black pieces and adhere to the back of the hoop, cut away any pieces that are too big for the frame. 4. Cut the houses from the second black piece and layer with foam pads. 5. Cut two houses in brown and layer with foam pads. 6. Layer 3 three of the cars in red, keeping the tree on top of it. 7. Layer two green trees, to add more height. 8. Add the glitter glue to the tops of each element to give the effect of snow. Now you have your very own DIY Build a Scene embroidery hoop! Hang this on your wall, door or place it on a shelf to add festive cheer to a room! Why not try this project all in white for more of a minimalist Christmas look? 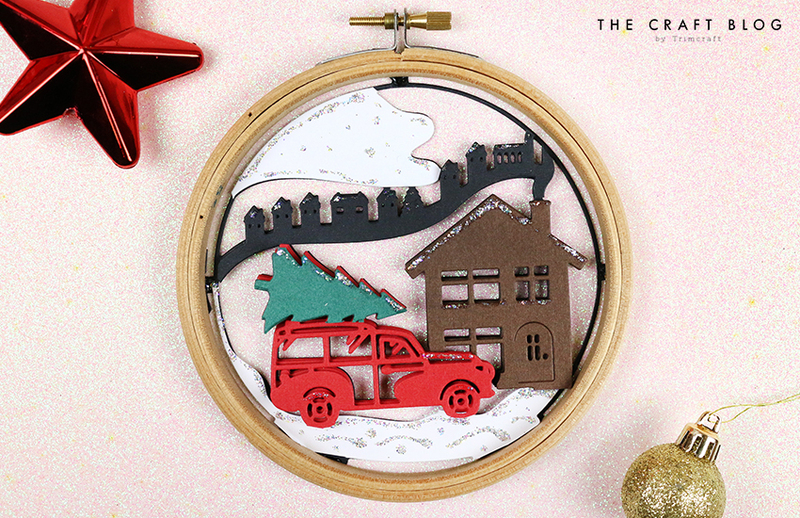 Will you be making a DIY Build a Scene embroidery hoop decoration this festive season? We’d love to see if you do, so don’t forget to #Trimcraft when uploading to social media and to share your makes in the Inspiration Area. This is such an awesome idea, and who doesn´t have some of those old hoopss laying around somewhere, that can be re-used again this way. I love it, thanks soo much for sharing the idea here.